Our Mahogany dowel rods are produced from Honduras Mahogany. Mahogany is used in high end furniture and cabinet making, reproduction furniture as well as turning. It works well with hand and power tools and stains and polishes to an excellent finish. 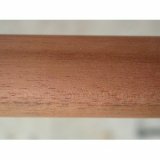 Mahogany Dowel Rods are available in 36" Lengths. Click "More Info | Order" for pricing discounts and to place your order.